What is a BNC Cable? A BNC Cable (Bayonet Neill-Concelman) is referred to as a type of radio frequency (RF) connector which is used alongside coaxial cables. As mentioned above, the BNC cable is used with coaxial cables. Examples of coaxial cables include the RG-58 A/U cable. This cable is primarily of the male type which means that it features a pin at the center of the end into which it connects. As a safety feature, the BNC connector features a ring around the connection which is used to lock the cable onto the female connector. Typical uses of the BNC cable include amateur radio antennas, test equipment, military equipment as well as aviation electronics. BNC cables are a common feature in many recording studios. 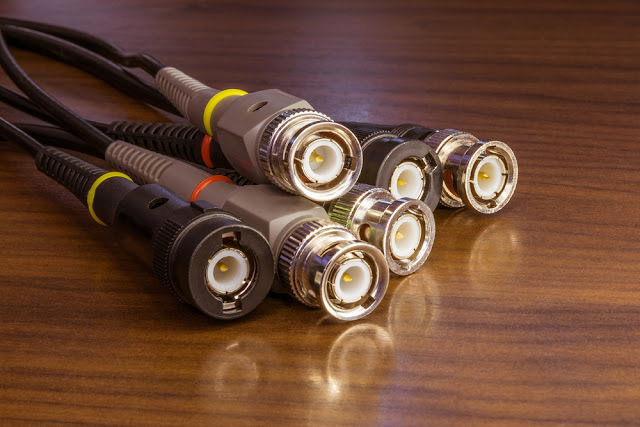 This is because digital recording equipment requires BNC cable connection in order to sync different components as well as transmit clock timing signals. Connection method can be used as criteria to categorize the type of BNC Connector, aside from the frequency capacities of 50 Ohm and 75 Ohm cables as described below. This connector type is available in two different styles, the 2-piece style as well as the 3-piece style. In order to connect cables with the crimp-on feature, you require a coax cable stripper as well as a coax crimping tool. BNC Twist-on connectors are much easier to attach, which makes them convenient. These connectors require no additional tools for attachment. Simply tear off the cable jacket to expose the copper braiding. Proceed to fold the braiding above the plastic shielding and then inject the cable inside the twist-on connector. Secure it using a clockwise manner. BNC cables are generally used with voltages not exceeding 500 Volts and frequencies under 3GHZ. 50 Ohm connectors are designed to handle frequencies of up to 4 GHz while 75 Ohm connectors are used with frequencies of up to 2 GHz. The BNC cables exist in two versions, the 50 ohm version, and the 75 ohm version. Use of each version is dependent on the cables with similar impedance. Identifying cable version is easy. If you want to identify the 75 ohm type, check for a reduced or missing dielectric in the ends where the male and female cable ends meet. There are 95 Ohm BNC cables, although, these are rarely used outside the aerospace industry. Are you looking to purchase BNC cables? Check out our online store for BNC cables of all types as well as a wide range of other cables. Consult our cable experts if you have any questions or inquiries regarding BNC cables.